My two major goals for visiting Nepal were to rest and recover from my whirlwind trip through India and to do some sort of trekking, likely in the Annapurna region. What I didn't realize was that I would have the chance to meet and reconnect with some really incredible people along the way. Since I did so much back and forth within Nepal, and since the trek was the obvious highlight of my time there, I'll try to first cover my time in Kathmandu (both pre- and post-trek), then Pokhara, then finally.... the trek itself. 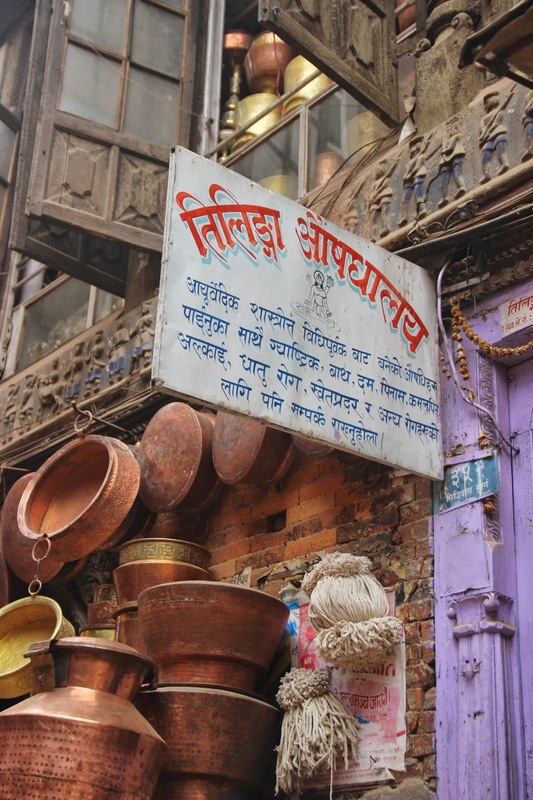 I had booked a flight to Kathmandu out of Delhi without having much of a chance to do much research in advance, booking a few nights at a spot called Elbrus Home, just outside of the busy tourist district of Thamel, splurging on a quiet single room. Despite arriving at noon, the kind guest house owners allowed me the incredible breakfast that was provided daily - two eggs, toast, porridge with bananas, juice, and coffee. I spent most of the rest of the day hiding out in my room, getting some much needed rest and catching up on one of my favorite TV series. 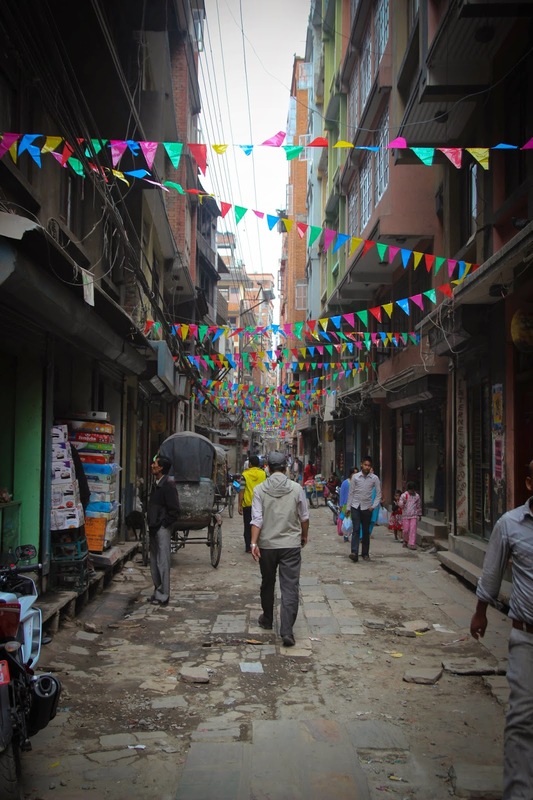 After the mad chaos of India, the streets of Kathmandu didn't phase me in the least, though I spoke to some new arrivals some days later who were astounded at the chaos, the dirt side streets, the incredible dust pollution, and the general lack of order. The one thing that did throw me off about Kathmandu and Nepal in general were the scheduled power outages. While the guest houses and restaurants had generators, there were long periods of time during the day, always on a shifting schedule, where main power was completely unavailable. Even in those places with generators, it usually meant that charging electronics in your room became impossible, and internet connections went from "generally slow" to "painful". She's probably grumpy about her slow wifi connection. That first evening, I emerged from self-imposed hermitdom to meet a Canadian guy, a German guy, and an Aussie couple who had recently returned from a trek to Everest Base Camp, who invited me to join them for a trip to what would become a regular mealtime destination, Western Tandoori. A complete hole in the wall with only a handful of tables in a tiny room with an open front, they serve some of the best naan I've ever tasted, freshly baked by a man who stood at the front of the restaurant by small clay oven, rhythmically flattening balls of dough, slapping them against a cloth bag, affixing them to the interior wall of the oven to bake, and clapping his hands just once before starting the process again. The naan was paired with somewhat oily but delicious curries, incredibly filling meals that generally cost around $1. After dinner we wandered around Thamel a bit, sampling the local beers, picking up a few necessities, and swinging by a bakery which offered half price pastries after 8pm, before returning to the guest house. 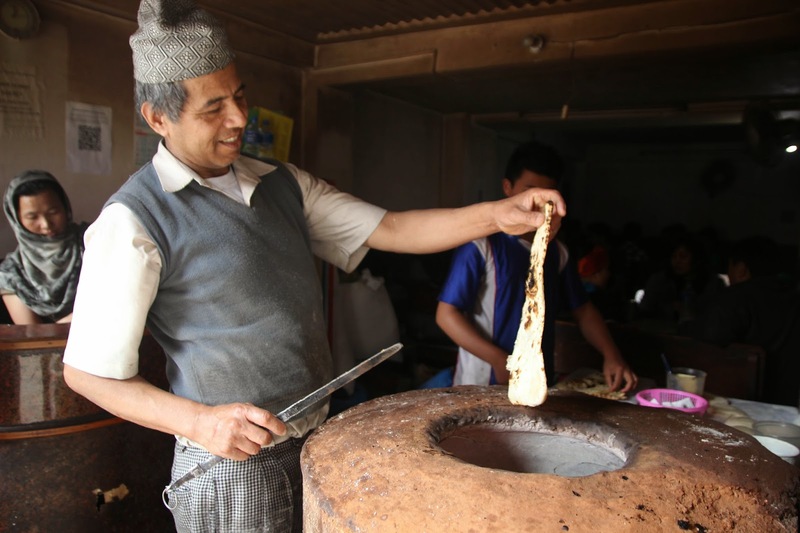 The expert naan baker at Western Tandoori never stops moving. 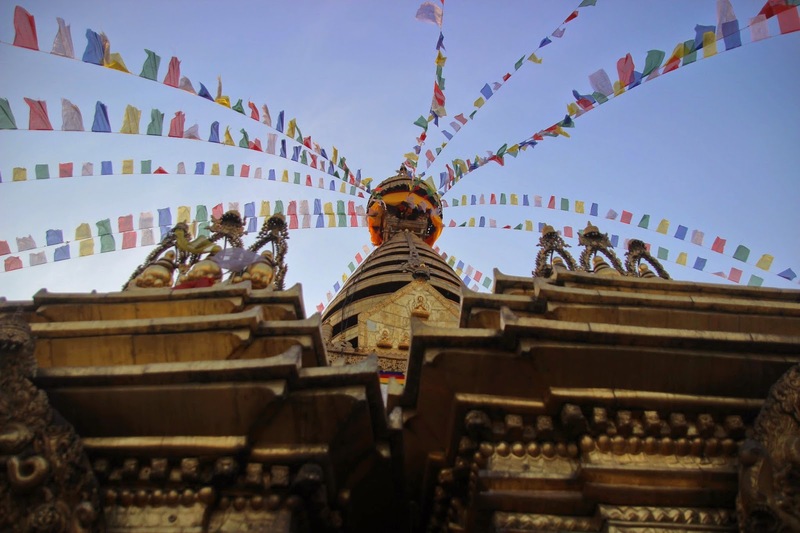 The following morning I joined the Canadian to visit Boudhanath Stupa, one of the largest Buddhist monuments in the world, and a major destination for pilgrims from the surrounding areas. It was pretty awe inspiring to see in person, from the large white dome of the stupa, to the tall golden spire with the peaceful eyes of Buddha painted across it, to the colorful prayer flags, fluttering in the wind. We circled around the base until we reached the entrance of the structure, where pilgrims were burning sweet smelling offerings in a large bowl, creating plumes of smoke. Just up a small set of stairs was a room with two large prayer wheels, spinning rapidly as people circled around them. Up another short flight of stairs, we circled the stupa itself, gazing up at the watchful eyes, taking in the amazing colors and beauty of the prayer flags. 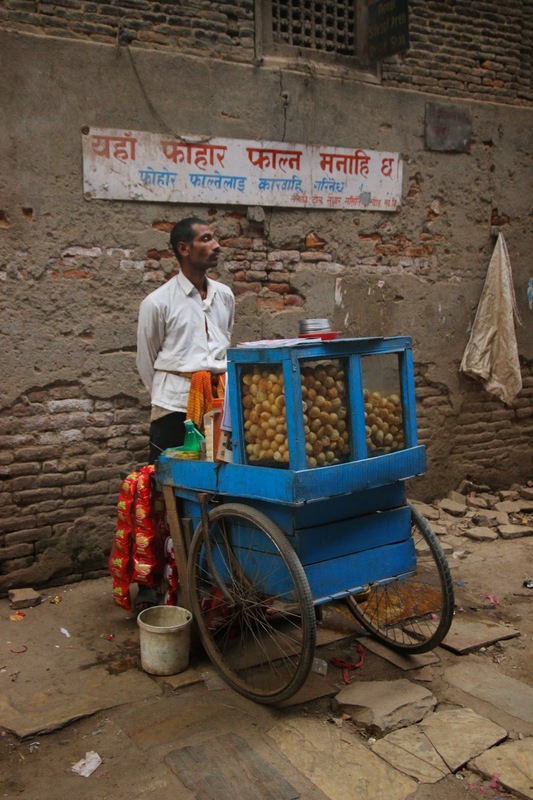 Once we had completed the circumference, we ventured down to some of the small shops that surround the stupa. In walking back over for a few additional photos, I ran across some uniformed schoolboys begging me to take their portrait. 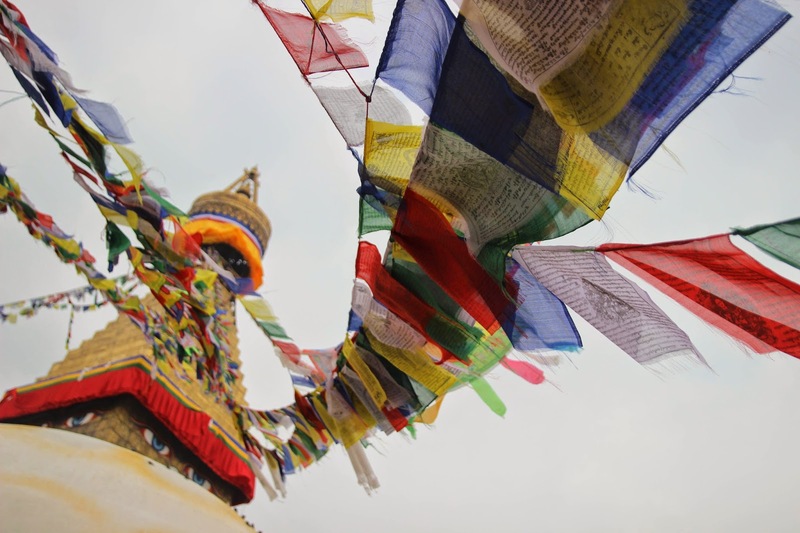 The colorful prayer flags are one of my favorite things about Nepal - they can be found almost everywhere. 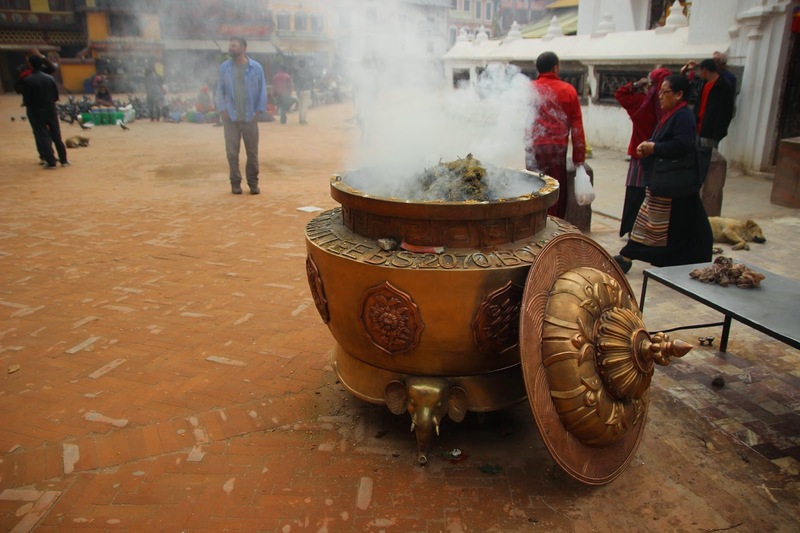 The warm scent of offerings fills the air around the stupa. 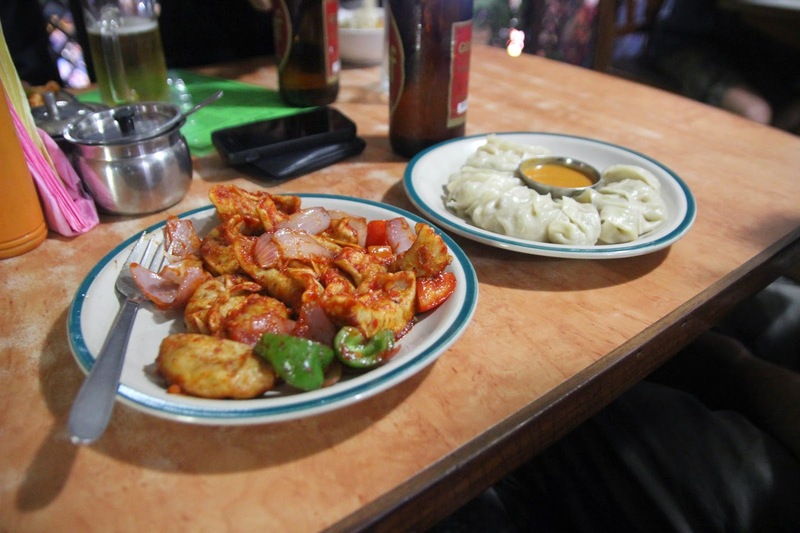 That evening, I ventured out with the same group to experience another Nepalese culinary delight: momos. We visited a spot in Thamel called Yang Ling for these delicious dumplings with various fillings. The specialty of this place in particular are the chili momos, dumplings which have been lightly fried in a spicy chili sauce. I sampled pork, chicken, and veggie varieties, all of which were absolutely delicious. Somehow I never made it back to Yang Ling, but I made sure to try the momos in a number of different spots later on! Fried chili momos on the left, paired with simple steamed momos on the right. The next day I spent most of the day at a spot that would become a sort of western sanctuary for me in Kathmandu, a place called Himalayan Java Coffee. One of the few places with "fast" (this is all relative) wifi and excellent local brewed coffee, I spent hours there over a number of days, editing photos and writing blog posts and doing bits of research on trekking options. That morning I had met a wonderfully entertaining couple of guys - Aidan from Ireland and Caleb from Michigan - who had just returned from trekking around Annapurna and were planning on enjoying happy hour at a spot called Shisa Terrace around the corner from my new favorite cafe. 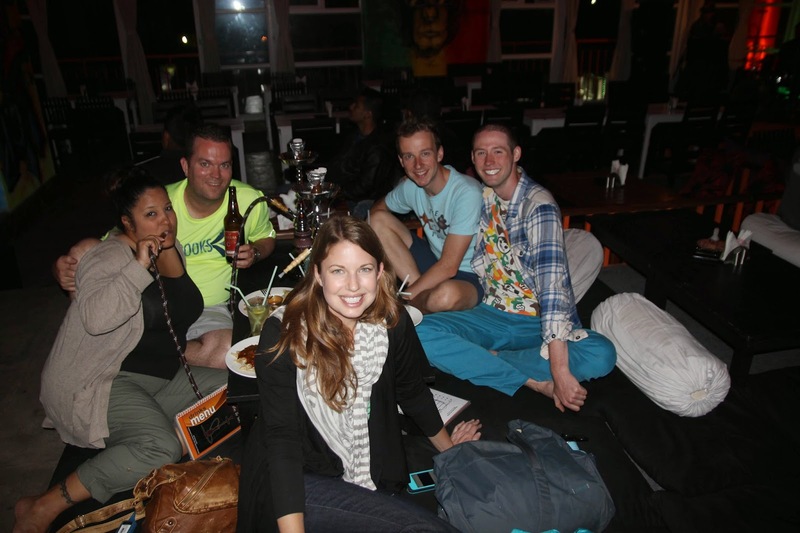 I also wound up meeting up with one of the incredibly fun couples from my India tour - David and Tania - at the cafe, and we decided to join the guys for a night of tasty drinks, shisha (that's hookah), momos, and live music. We also met a random local guy who entertained us all night with brain teasers, setting up matchsticks in patterns and asking us to move them around to form this or that other pattern. Not only was it an amazing evening, but we somehow repeated the entire experience the following night! This time we were joined by my friend Kirsten, whom I had met way back in Argentina, who had been volunteering and traveling with her cousin Christina in India and were now spending some time in Nepal before returning to the States. (And on this occasion, our same random local treated us to riddles scribbled on napkins.) 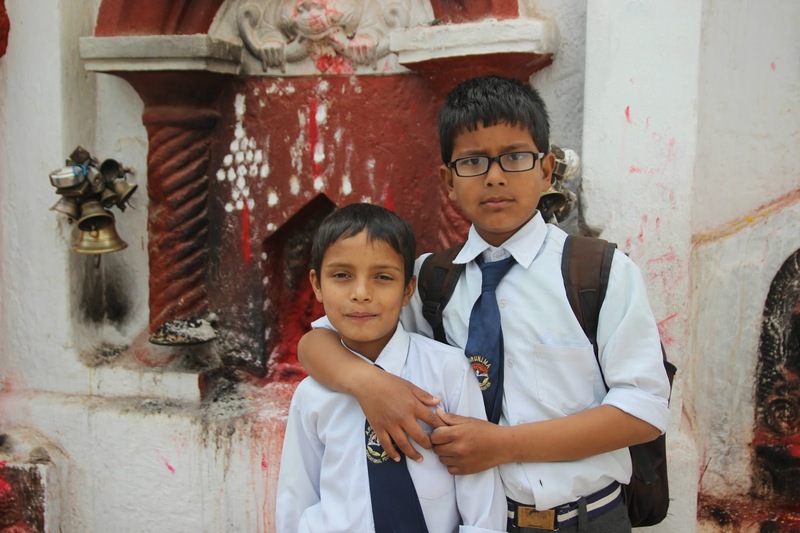 It was amazing to see them, and we planned on meeting up again a few days later in the small lakeside town of Pokhara, a gateway to trekking for the Annapurna region. 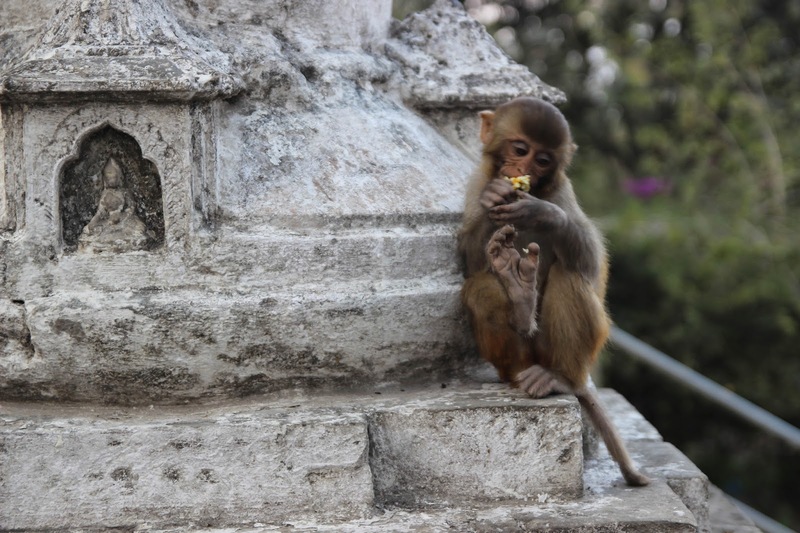 Prior to our reunion at Shisha Terrace, I ventured out to spend some time at Swayambhunath Stupa, also known as the Monkey Temple for the furry inhabitants of the steps leading up to the temple. While not as large as Boudhanath Stupa, it was no less impressive. Perched high above Kathmandu, the view was incredible, and between the setting sun and the cool breeze, it was the perfect environment to take in the spectacular beauty. Because it was slightly smaller, I was able to pause for longer to take in the details of the space, watching groups of monks and pilgrims circle the stupa, listening to the small bells chiming with the wind, and picking out a small pair of earrings from one of the handicraft vendors before returning to the guest house. Looking straight up at the stupa's umbrella, from which dozens of strands of prayer flags are affixed. 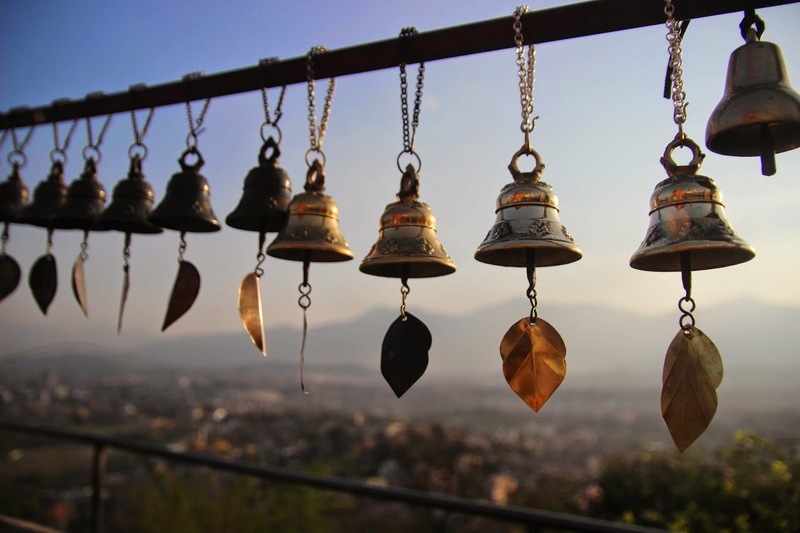 Bells at a vendor's stall shining over the city of Kathmandu. 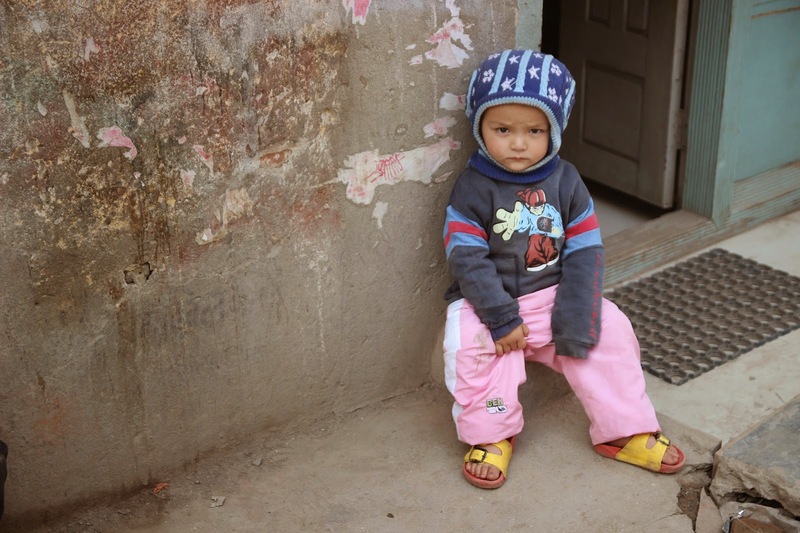 This adorable little girl's father kept trying to get her to post with her hands together in a "namaste" pose. One reason the "Monkey Temple" has its nickname! The following evening, the final one I would spend in Kathmandu prior to my trek, I joined Aidan and Caleb for a delicious meal at a vegetarian restaurant called OR2K. The food was simple, fresh, and wonderful. I made sure to return on my next visit to the city! Upon my return to Kathmandu, I checked into a different location - Alobar 1000, a cheaper option with dorm rooms that were comfortable enough for a few days. Thankfully I had a room on the ground floor and not near the rooftop bar! Upon checking in, I immediately bumped into Eric, Kirsten and Christina's friend from their time in India that I had met back in Pokhara, and Rom, a Belgian guy we had met at the end of our trek, both of whom were staying in the same place! The hostel was in a slightly different location from my previous one as well, just on the edge of Thamel, and just down the street from a second Himalayan Java location, which quickly became my new home base for sorting and editing the hundreds of photos I had taken during the trek. After a day of recovery and photo sorting, I finally ventured out to visit Durbar Square, one of the few major sites I had missed on my first visit to Kathmandu. As I made the long walk past tourist shops, down long narrow alleyways with plastic flags strung between the buildings, I came upon a bustling Sunday market, absolutely packed with people. I first passed piles of copper cookware, scarves, jeweled saris, and shoes, before coming across dozens of varieties of local produce - ladies (and occasionally men) surrounded by fresh mushrooms, tomatoes, peppers, asparagus, green onions, garlic, and a variety of greens. These colorful plastic flags were an interesting bit of decoration, cheering up a dusty alleyway. 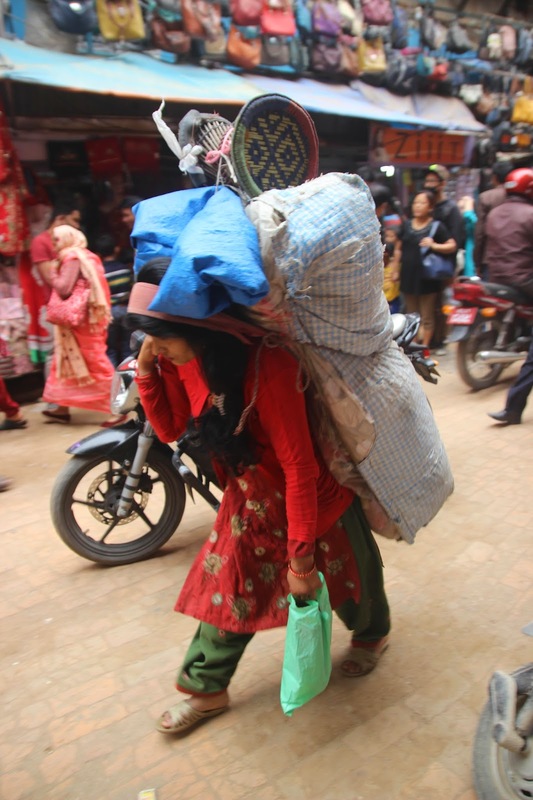 The typical method of carrying large loads in Nepal - toss it on your back, with a strap around your forehead for support. Stacks of copper cooking ware are displayed outside this shop door. 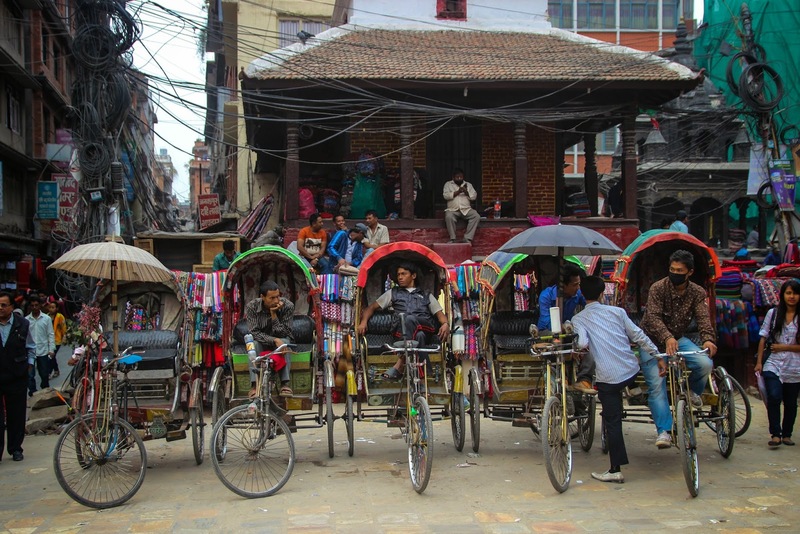 Pedal rickshaw drivers awaiting passengers outside the Sunday Market. 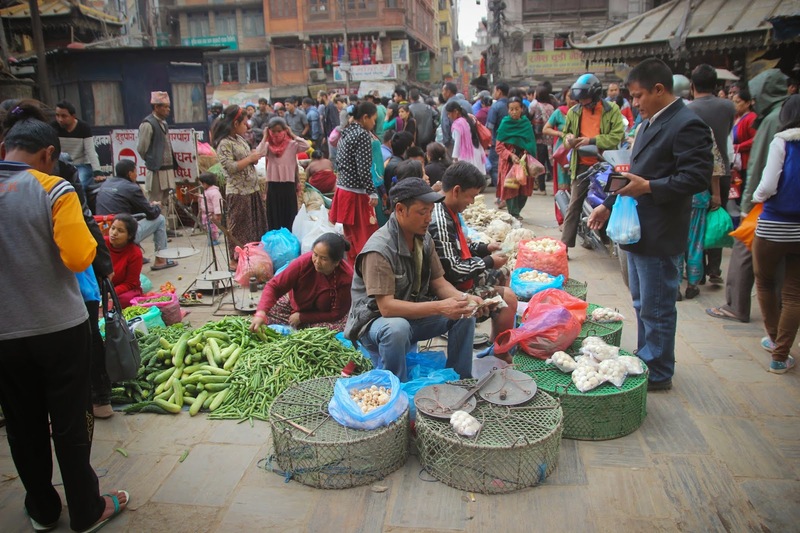 There's no shortage of vendors or shoppers at the Sunday Market. 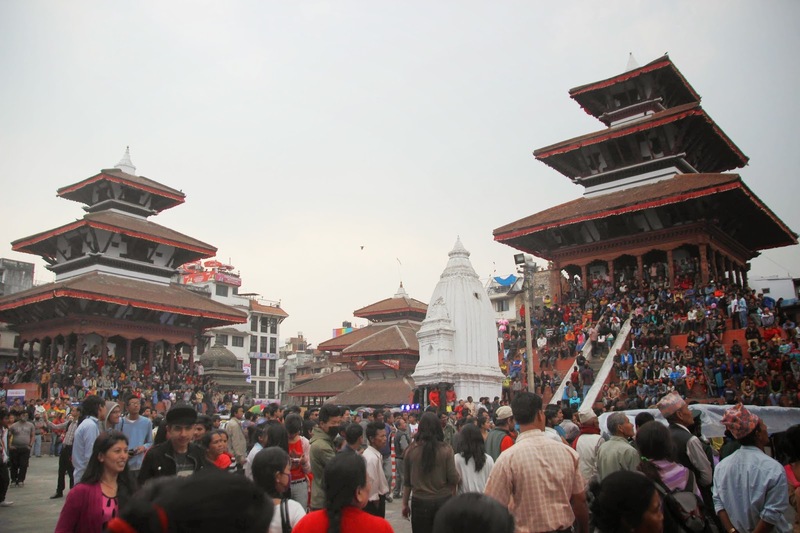 I wound my way through the crowd until I finally reached Durbar Square, paid my foreigner entry fee, and made my way inside. The area as a whole was a sprawling collection of old pagoda-style buildings, mostly in black and red. Upon entering the ticketed area, I spotted a white building with black details in wood, a sharp contrast to the red brick and carved wood elsewhere. I explored the various rooms and plazas, many of which didn't allow photography, containing beautifully sculpted or carved Hindu and Buddhist images. One large plaza with a particularly ornate facade was also apparently the site of a mass sacrifice of goats and buffalo just a few days prior - an event that apparently happens twice a year. (I did at least confirm that the animals are eaten after begin sacrificed, but the entire ritual seemed very strange after passing through so many strictly vegetarian areas within the country!) I moved through the remaining plaza, noting the tiny wood carved details set into the brick walls and surrounding the doors and windows - detailed latticework and framing (including a column of skulls around one door). Finally, I climbed up the steep stairs of a nine-story pagoda, taking in the view of the surrounding city from above. 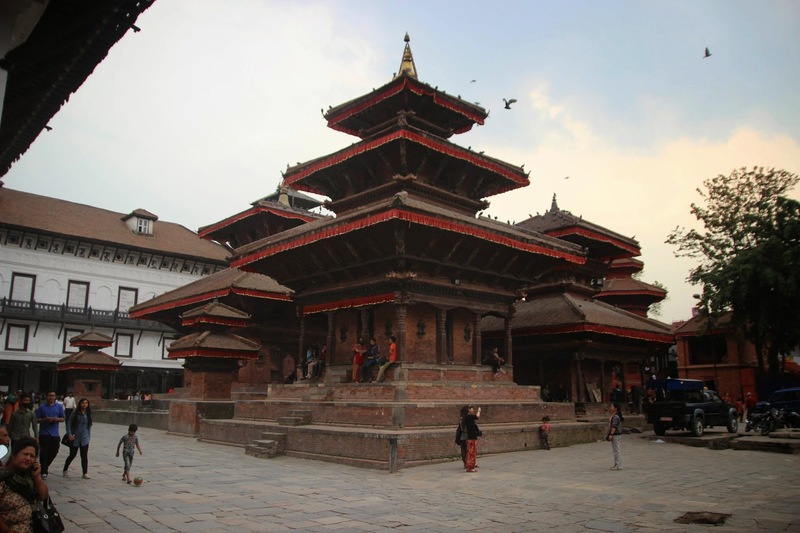 One of the many pagoda-style buildings in and around Durbar Square. 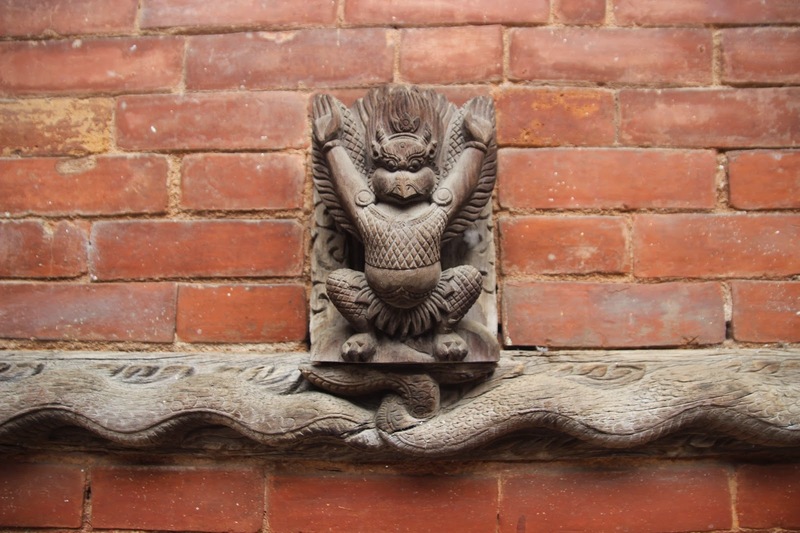 One of the many detailed wood carvings set directly into the brick walls. 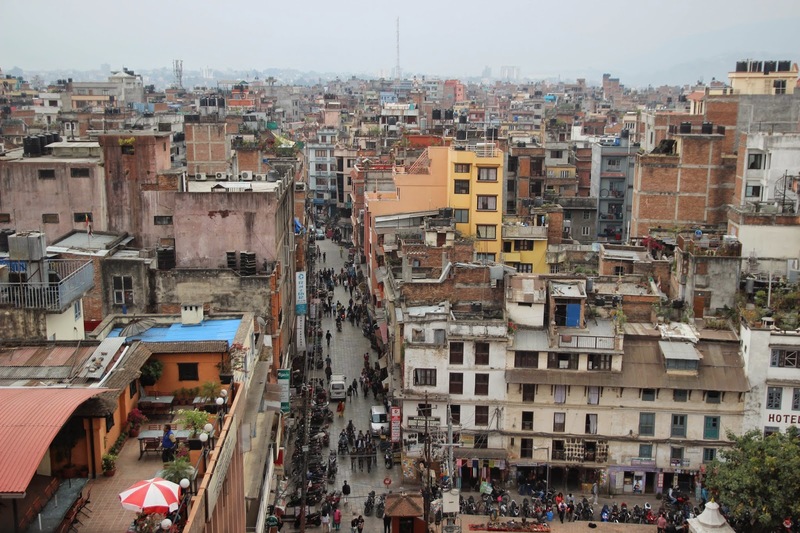 The view of Kathmandu's busy streets from Durbar Square. 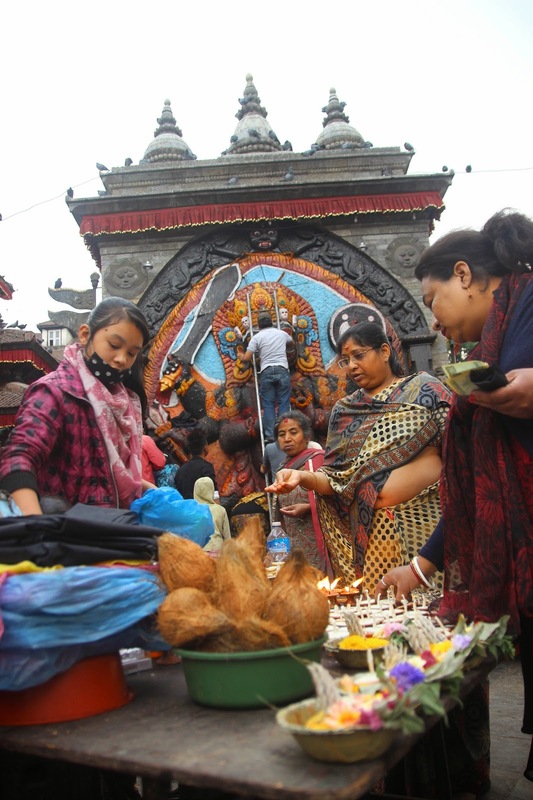 After leaving the interior section of Durbar Square, I wandered around a bit, happening upon a stage and a mass of people, undoubtedly preparing to celebrate the Nepali New Year. In a nearby spot, locals bought gifts for what I assume was a Hindu icon, including tiny pastries which were literally pressed into the mouth of the statue. Unfortunately it started to rain, so I slowly made my way back through the still-large crowds at the market, doing a bit of shopping of my own along the way. That evening I returned to OR2K - my third visit in total - for one last dinner in Kathmandu, amidst some of the New Years celebrations. I planned to save my own celebration of the New Year for Thailand, where I had planned to arrive right in the middle of their Songkran festival with an early flight the following morning. Visitors packed the square in anticipation of a New Year's celebration. Buying gifts and food, which is being stuffed into the idol's mouth in the background. Next up, my pre- and post-trekking experience in the lovely town of Pokhara, followed by a detailed recap of my time journeying to Annapurna Base Camp.